Some people would be satisfied with starting up their very own country, but not Danny Wallace. Not only has he set up his Kingdom of Lovely – which occupied the space of his East London flat – he's also created a cult, played a character in the Assassin's Creed game franchise, has made a couple of Horizon documentaries – one about the intelligence of chimps, the other about robots – and is currently getting up disgustingly early to front the breakfast show on London's XFM. He's nothing if eclectic in his choice of projects. And although writing a novel, by comparison, looks a little dull (particularly one that apparently he wrote without the help of either chimp or robot), Wallace has managed this feat with his usual entertaining gusto. For most couples, the most awkward part of the relationship is usually the end. Jason Priestley (definitely not the Beverly Hills 90210 actor) is no different. The main cause for his relationship fizzling out abruptly was due to him sleeping with another woman; that will usually do it. Now he finds himself aimlessly drifting in almost every area of his life. It's no surprise that a chance meeting with a stranger on a trendy London street stirs his imagination; after helping a woman having problems getting into a cab, he notices she has inadvertently left something behind: a disposable camera. It's an encounter that despite its brevity, has a startling impact on his life. Along with his flat mate and best friend Dev, they begin a romantic search for this stranger, one that they really don't want to be confused with as stalking. This unconventional approach to possible romance leads Jason, and his small collection of friends, on a journey that takes them all by surprise. This boy-briefly-meets-girl tale is a delightfully easy read; it's the kind of book that you'll happily pick up and indulge without the need to think. At all. That's no bad thing; sometimes it's nice to just to read a book that doesn't go out of its way to challenge. The main protagonist is warmly engaging; he is, for the most part, well-meaning, and there is a romantic glow about him as he embarks on his search for a woman who is a complete stranger. The fact is, is that this search is actually a sub-plot of the book; the search is essentially the catalyst that drives Jason from a fairly dark and lonely place, into a whole new world. 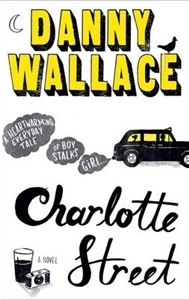 Wallace uses a voice that is light, chatty and likeable, despite the fact that the book occasionally dips into overly familiar themes of trendy, media London; Jason leaves a job in teaching – which is understandable considering – for a job reviewing for a listings mag. Although, thankfully, not that glamorous, it does make the book, along with its supposedly trendy title locale, annoyingly media savvy. Still, it's a welcome debut that showcases Wallace's already considerable talent for being witty and appealing. Whether Wallace has any more novels in him is unclear; it may just get in the way of him wanting to make it a law to hop on your left leg every other Thursday; support the change of the national anthem to the Birdy Song; or campaign for the tube to have a Jacuzzi in every carriage. But if he does manage to write another one, it's bound to be just as enjoyable to read as this one.